I’ve made thousands of delicious, creamy smoothies over the years and have turned it into sort of an art form. The good news is anybody can learn how to make smoothies like I have. Once you get the basics down, you’ll be creating smoothies like a master in no time. This guide will teach you everything you need to know to make the smoothie recipes on Healthy Smoothie HQ, recipes you find elsewhere, and better yet, new recipes you dream up on your own. Learning how to make a smoothie is actually pretty easy if you follow the steps below. Determine the smoothie recipe you would like to make based on your purpose. Are you on a diet, looking to lose weight, and in need of a meal replacement? Or are you trying to get more greens into your diet, protein after a workout, or simply looking to make a delicious dessert recipe or a tasty snack? If you don’t have a recipe in mind, peruse this site for plenty of healthy options, search the internet, or ask a friend for a good smoothie recipe. The first thing to add into your blender is the liquid, which is usually around 1 to 2 cups. Follow what your smoothie recipe calls for, but keep a few things in mind. The more liquid you add, the more watery or runnier your smoothie will be. Some people like it this way. If you prefer a thicker consistency, use slightly less liquid. Here are the liquids I recommend for making healthy smoothies: water (filtered or real spring water), almond milk, coconut milk/water, raw milk, organic fruit juices, fresh squeezed or pressed juice, tea, and kefir (from milk or coconut water). The “base” is what will provide a creamy smoothie texture. Think of it as the “body” of your smoothie. Many smoothie recipes call for a banana or two. Bananas are a terrific base and provide your smoothie with a nice creaminess, and sweet taste. Fruits such as mango, peach, pear and apple will also do the trick. Other good options include avocado, coconut meat, chia seed gel, nut butters (almond is my favorite), yogurt, frozen fruit and ice. Water rich fruits like watermelon and pineapple won’t give you that creamy smoothie consistency. 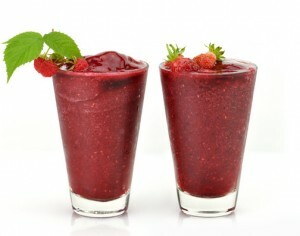 Adding ice is a quick and easy way to thicken a smoothie full of water laden fruits. Now that you’ve got your liquid and base squared away, it’s time to add the fruits and/or vegetables the smoothie recipe you’re making calls for. This is also a great time to experiment, get creative, and have fun exploring the various fruit and vegetable combinations your taste buds adore. Most fruit can be used either fresh or frozen, see which you prefer. I tend to like my berries frozen (and often use as a substitute for ice), but most other fruits fresh. If you’re making a green smoothie with the likes of spinach, kale, beet greens, dandelion greens, arugula, or lettuce, you may want to cut the greens into smaller pieces depending on the power of your blender. You also may want to add the greens into your blender last, after adding any optional add-ons. This is where you can really take your smoothie to the next level of nutrition and tastiness, and have lots of fun doing so. Many of the add-ons below can be incorporated into a number of smoothie recipes. As your smoothie skills develop, you’ll intuitively know which add-ons to use in which recipes. The list below is not meant to overwhelm you, but rather give you an idea of what’s possible, and available. Most smoothie recipes include enough sweet fruit to bypass a sweetener to enhance the taste, but if not, here are some good ones I recommend: honey, stevia, maple syrup, and dates. Avoid the popular sweetener agave nectar, here’s why. Xylitol is also questionable. For more info on sweeteners, check out my post on the best and worst sweeteners. A dash of a high quality salt will increase the minerals and improve the taste of your smoothie. I prefer Celtic sea salt and pink Himalayan salt. There are a plethora of good salts to choose from, just make sure to avoid nutritionally bankrupt white table salt. You can also adjust the taste, and healthiness, of your smoothie by using common spices. Cinnamon, vanilla, ginger, nutmeg, and cayenne are a few of my favorites. If you’re making an after workout smoothie or simply looking to get more protein into your diet, add in a high quality protein powder. I recommend Sun Warrior, Warrior Whey, Dr. Mercola’s Miracle Whey, and a good hemp protein powder. The protein powders come in several delicious flavors further reducing your need to add a sweetener. There are an abundance of superfoods available to boost the nutrition of your smoothie. Here are some of my favorites: cacao (raw chocolate), maca, flax seeds, goji berries, spirulina, coconut products (oil, shreds, flakes, meat), bee pollen, hemp seeds, acai (powder and juice), aloe vera, and colostrum. There are also a number of highly nutritive green superfood powders designed for boosting the nutrition of your smoothies. My top picks are Ormus SuperGreens, Boku Superfood, and Vitamineral Green. Now that you’ve added all your lovely ingredients into your blender, it’s show time. Depending on your blender, and smoothie ingredients, you may need to start out on a low setting (or pulse) before getting up to top blending speed. Some blenders even come with a handy smoothie button for extra easy smoothie making. I like to blend my smoothies until the liquid is fully circulating within the blender for about 5 seconds. Total blend time is usually between 30 to 60 seconds depending on the ingredients. It may take you a few blends to get it down. Don’t worry, once you do it will become second nature, like riding a bike. Now for the most important smoothie making step of all: Enjoy and Share! Here are a few of the common smoothie making mishaps people often experience along with the remedy. Is your smoothie too frothy? Try using a little less liquid, and make sure not to blend too long. Try withholding the liquid (maybe just half) until the other ingredients are thoroughly mixed or liquefied, then add the remaining liquid and only blend on the lowest speed until it’s incorporated. The thickening or “base” ingredients mentioned above (banana, avocado, coconut meat, chia seed gel, nut butter, yogurt, frozen fruit and ice) will help. Milk can cause frothiness, maybe try organic apple juice or water instead. When blending greens like baby spinach, you won’t need as much liquid because they blend so well and contain a fair amount themselves. Is your smoothie to runny? The quick fix for this is reducing the amount of liquid. More thickening smoothie ingredients will also alleviate this problem. Is your smoothie not tasty or sweet enough? Simply add a little more of your preferred sweetener. I recommend honey, stevia, maple syrup, and dates. Is your green smoothie too bitter? This happened to me the first time I used dandelion greens. Use less greens and/or more sweet fruit and sweetener. Is your smoothie not blending very well? Filling your blender jar to high might result in less than ideal blending. If you have an older or low powered blender, you may need to blend your liquid, base, fresh fruit, and greens (chop into small pieces) first, then add in any frozen fruit or ice cubes and blend until nice and smooth. You may also need to add more liquid to balance out the ingredients. Your blender may be the culprit. You may have an older, less powerful, blender that simply can’t get the job done. Not sure which blender is best for you? See my post on The Best Blender For Making Smoothies Revealed. Have a Tip or Story On Making Smoothies? Is there a smoothie making tip or trick you employ that I failed to mention above? Have a funny or embarrassing smoothie making story? I’ve got a one. One time I failed to put the lid on my blender bottle and sprayed a half blended smoothie all over my kitchen, even getting my ceiling nice and dirty. Oops! I certainly learned my lesson. Please share your smoothie stories below in the comments. Happy Blending! This was a very good recipe…? Well whatever it is called, it was very easy to follow, and exactly what I really needed to make a smoothie. Since I don’t follow a recipe, and I just experiment, I needed something, to tell me how to put it in, the base of a smoothie basically. A guide, and this did exactly that. I could understand it really well. Props to you, the maker of this smoothie guide. You’re welcome, Magda. Good luck with your smoothies! Hello Ryan,I am getting the best smoothie recipes from you.Thanks for that. I am looking forward to more recipes in all aspect of life ,whether weight loss,whatever.Please I need more especially ebooks.Send them via my email. You’re welcome, Edwin. Be sure to search my site as I have over 200 recipes and numerous articles on subjects like weight loss. Another eBook is in the works. Great information Ryan! I haven’t started yet making smoothies but I’m getting myself prepared with info and making up my grocery list. Thanks again. You’re welcome, Karen. Good luck with your smoothies! Ryan, I just came across your website and received your e-book yesterday. I have been drinking green smoothies twice a day for about a year and have lost close to 100 pounds. I am always looking for more information & recipes to help me in my journey to good health and still have about 60 pounds more to lose. I enjoyed a modified version of your peanut butter oatmeal smoothie this morning and look forward to trying out many more recipes. You have made so much information available to all who are searching. Thank you so much for sharing your knowledge of all things smoothie! Hello Siobhain from Ireland. Nice to hear you’ve hopped on board the healthy smoothie (and juice) train and are feeling good. Those flasks look sharp. One question/concern: are they difficult to clean with the narrow neck? ok i have this problem when i do my smoothies, everything its good, the flavour, the sweetness, the salt, the cocistence, but i have trouble calculating the portions, because i wanna do 16 ounces smoothies, but somethimes i miss calculate and i end with extra smoothie or less smoothie than what i need, so my question is the following: how do i calculate the portions of ice, fruit, etc. to make a 16 oz smoothie? Good question, Fernando. The best way to control the size of your smoothies is by dialing in the amount of liquid you are using. Determine portions for the ingredients based on your health goals and preferences. Then add the right amount of liquid to get to 16 ounces. It may take a few tries, but once you get it down it should become second nature. Why is it that you want 16 ounce smoothies? Hello Ryan I love smoothies and I love your website. I have learned tons from your pages. When is the best time to drink a smoothie? I don’t like to eat a lot for dinner when I am at home. Going out to dinner I will eat a regular meal. I enjoy my smoothies also in the morning. So when is the best time, nutrionally to have a smoothie? Thanks for the love, Tana :) Nutritionally, there’s really no best time. However, most people including myself enjoy smoothies for breakfast. You want to be sure to consume smoothies on an empty stomach to maximize digestion and absorption, which is easy if you consume in the morning. I am now 26 and need to start to incorperate vegetables into my diet, i like all fruits but i know im not getting the vitamins i need! I have tried vegetables and can honestly say are disgusting! The million dollar question is can you hide the taste of vegetables in smooties? And make them bareable enough so i am getting the vitamins i require. Yes, you can hide the taste of most veggies in smoothies. That’s one of the number one reasons I turned to smoothies several years ago. Start with bland veggies like baby spinach and then try other leafy greens such as kale and beet greens. Hi! great article! I was just wondering if you add yogurt to the smoothie, would you put it in during step 3? Yes, step 3 is the appropriate time to add yogurt, mags. I can’t wait to start these recipes. I have a very bad habit of falling off the wagon after a while. Any ideas? I need to lose weight so I can enjoy life. I am sure your suggestions will help. I love cacao,can I use that in a smoothie? I have a Nutra bullet and a Vitamix, which is the best? Is coconut oil better than grape seed or olive oil? I use to fall off the wagon too. Try to surround yourself with people (and food) that support a healthy you. Cacao is a great smoothie ingredient and blends well into almost all smoothies. NutriBullet and VitaMix are both great blenders, use whichever you prefer. In smoothies yet, use coconut oil. Thank you Ryan, I have deepest gratefulness for the effort you have put into your website. You have helped me immeasurably to learn how to put together all these super food ingredients..( which just seemed to overwhelm me before. ) into delicious, nutritious and healing smoothy meals. You are a much needed and earth angel. Thank you. Thank you for the thoughtful and kind comment, Beverly :) It means a lot considering the time and effort I’ve put into this website. It’s great to hear you’re making delicious, nutritious, and healing smoothies! My family drinks Da Vinci Gourmet’s smoothies, but I’m told it’s not healthy. So I would like to start learning how to make healthy smoothies. I’m looking to make a strawberry flavor smoothie for myself. I’m not sure if that would give me the strawberry flavor, but I think I read somewhere the flavor of fruit is stronger than vegetables. Reading online, people suggested ice instead of water. You have ice listed as a base. Can I use ice as both liquid and base? Fruit flavor and sweetness does typically over power the taste of greens. I would suggest using only 1/2 cup kale as it can be pretty bitter. Using ice is fine, but you might want to add a little water to facilitate the blending. Tweak the recipes until you find your sweet spot! If the base is frozen bananas, would you add it last rather than early? I prefer to add right after the liquid, but it’s more personal preference than anything. Hi Ryan! Thanks for the information. I found them very useful but my problem is how to get a particular taste after the whole blending. I mean a homogeneous most mixture. And most times they are not very smooth. Please what do I do? What did you use as your base, Peppy? Avocado is my favorite base and always leads to a thick, creamy consistency. Please can I use the water from watermelon as a base? Yes, water from watermelon can be used as the liquid. You want something with body like avocado or banana as the base. I’d like to start on the ‘smoothies’ path; got your e-book just now. Recipes are not daunting at all so I have no excuses not to start. Question: will a hand-blender work? I have a Fissler hand-blender which I’m thinking of using, if it were ok. I have a new powerful blender (not the expensive ones), and if I add chocolate chips to my blender (in a smoothie), everything is crushed (almonds, nuts, fresh and frozen fruits, leaves, ice cubes) except chocolate chips (not all, some are un crushed). I wonder why a few chocolate chips escape the blending, but everything else is crushed. I’ve never used chocolate chips because they typically aren’t pure chocolate. I recommend cacao nibs. I actually like some chunks in my smoothies as it forces me to slow down and chew, which improves digestion. Hi Ryan, I send you my love all the way from NIGERIA (AFRICA), surprised? ..yipee! smile.. Well I was on a search for a healthy, nutritious and energising way to blend fruits and not make it boring for my family. So I hit the Internet and I stumbled upon yours, and I’m I’m sooo excited I clicked on your site. Thanks for taking out time to explain, although most of the fruits are rare here, but due to your wide details I was able to search out fruits that are in line with those you mentioned. Now I make smoothies like a pro hahaha. My husband is professional soccer player which is what drove me to seek a nutritious yet simple way of getting him re-energised after the day’s sweat! I’m super excited that I have a limitless options to play with every week! Oh… whenever friends and family come over, guess what? I shine with my varieties without breaking a bank Fir it. God bless you. Right back at ya with love, Pearl. I am completely new to making smoothies, but as an intelligent working mother of twin kindergarteners, I figured, I GOT THIS. Why is there a consistent undertone of pepper ruining the vanilla yogurt, chocolate whey protein, kiwi with skin, Kyo Green powder (grasses, kelp, FOS), and MegaFood daily energy powder (beets,green tea, Bacopa, B12). I have tried removing each of the supplements separately and remaking the drink, same result. I NEED to boost my energy, my immune system, my quality of life for the tiny little cells that are put thru hell every day inside a lunatic trial attorney with a beautiful busy family, did I mention twins??? ?😮 I need serenity in a blender… MINUS THE ALCOHOL 😂 can this be achieved? I honestly have no idea what would cause a consistent undertone of pepper. I’m surprised removing the ingredients one by one didn’t identify the culprit. Is it possibly something from your blender? Also, for your immune system. My smoothie-making life changed when I bought a VitaMix blender. I hemmed and hawed over getting one for, I kid you not, more than 20 years. I finally bought myself one for my birthday just over a year ago and I use it every… single… day. I can relate, Jed. An Oyster Beehive blender served me well for several years. My Blendtec (and now Vitamix) were game changers. Do you recommend a blender or a smoothie maker? I have one more question. For my smoothies I love to have oatmeal inside. Did need to cook it? I love you website, have a good smoothies. I am trying to lose at lease 10lbs. Because my doctor say I have a very high Cholesterol. I do exercise 4 times week. Hi Ryan, quick question for you! I make smoothies everyday as a meal replacement. I also use Garden of Life Organic protein plus greens. In the directions, it suggests 6 oz of almond milk and 1 scoop of protein powder. I always make a large batch, so I use 2 cups of Almond milk. Does that mean I can double the amount of protein powder to 2 scoops? I’ve wondered about this forever! I hope you can help! ! That’s a good question for Garden of Life. However, I would stick with just one scoop of the protein powder, that should be sufficient. You can increase the amounts of other ingredients like you have with the almond milk. Absolutely hands down one of the best and easiest posts on making smoothies I’ve ever seen! Keep up the awesome Work! And you reply to every post. That’s great!!!! My question is do you have any tips or smoothie recipes that are geared towards expectant or nursing moms. As an expecting mom I’m trying to find realistic ways to increase my fruit, veggie, and protein intake. I love smoothies and eating fruits/veggies. But I find in this pregnancy that I tend to eat fruits and veggies, but not as much as I normally would. Also, with the price of smoothies it’s just expensive. Any advice/tips you have would be greatly appreciated! You don’t want to overdue it with sweet fruit. Ryan, thanks for the info. The everyone what’s to ask but can’t figure out how to ask – your over the years best trick, solution for keeping your power from caking to the side of the blender (NutriBullet) and not mixing? It’s super frustrating to complete your blending and find a quarter of the powder stuck to the sides. Creating the need to scrap and reblend the smoothie, sometimes making the smoothie over blended. Looking forward to your answer. Good question. I usually add the liquid first and then the powders, carefully so they don’t touch the sides as much as possible. This hasn’t been a big issue with my Blendtec. If it is, I stop the blending and use a spatula to scrap the sides and then do another quick blend. 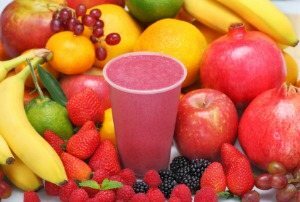 Smoothies typically last about half a day refrigerated – it depends on the the ingredients. I haven’t experienced a darkening from bananas. Great article. I actually like to blend liquid and greens first; breaks them down very well, and is not so taxing on equipment motor. Especially if using the bullet products. I recently started smoothies after years of thinking that eating fruits abd vegetables would taste disgusting in the form. I believe in healthy eating, but it must be enjoyed! Needless to say, I hace a new hobby. Lol. I spend a lot of time researching smoothies that target my goals or what’s in the fridge. I am actually eating foods in smoothie form that I gave never eaten. I still won’t in their natural form, but I can’t tell in the smoothie and it tastes good. I also cook less. Your story sounds similar to mine, MALCSMOM. I wouldn’t touch a number of fruits and veggies in whole form, but would blend all day long. However, I know enjoy most fruits and veggies on their own. Smoothies altered my taste buds. Look forward to healthier knee joints. Good luck with that, Raymond! Let’s try and fix that, Karen. Try adding a little honey, maple syrup, or stevia to sweeten. Are you using organic berries – those have more flavor than non-organic. Good luck to you and your nephew, Georgia! Please help me understand what I’m doing wrong. Every smoothie I make is gritty and chunky. I’ve tried recipes, I’ve tried pre mixed bags and nothing works. I always end up having to chew the smoothie and it’s gross. Just trying to make a simple strawberry banana, nothing crazy here. I’ve gone through 3 blenders always believing it was the blenders fault but I’m starting to believe it’s me. I just got a ninja professional for Christmas and my smoothies are still chunky. I run them in the blender for a long time and they are still gritty. I’ve added extra milk but then the whole thing tastes like milk and is frothy. All the chunks just settle to the bottom of the smoothie while the top just tastes like gritty strawberry milk. I’m a great cook and cannot comprehend how I’m so bad at this. Its so sad. Please help me. Also, I’ve burnt out blender motors trying to achieve a smooth texture. Even this one starts to smell after a minute so I always have to turn it off and wait. I thought this blender was going to be the answer to all of my smoothie problems. Maybe I’m a person who’s just not meant to enjoy smoothies..
Perhaps smoothies aren’t your thing, Holly. My best advice is in this article. Maybe find a friend who’s mastered smoothies to show you the ropes. Good luck!